Chabad is printing a Jewish calendar for the New Year - be a part of it!! Our beautiful Upstate Jewish Calendar, customized for the Upstate Area will be mailed and distributed prior to the Jewish New Year. Show your support of Chabad through a greeting or ad in the Hebrew/Secular Art calendar that graces so many homes and businesses. Let the Community know you are here every day of the year! 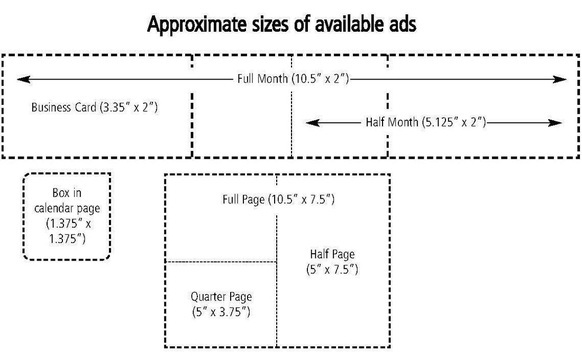 Ads in newspapers have a very short life span. Potential customers will view the “Jewish Art Calendar” the entire year - maximum return for your dollar. All business advertisers receive a complimentary listing on our website! Please note: calendar ads will print in black and white glossy. Deadline for all submissions is July 24, 2018.